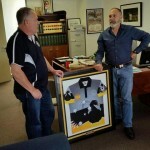 Rick Mazza being presented a framed SSAA shirt, by Ron Bryant the SSAAwa president. The shirt is in recognition of the mammoth effort Rick and the SFFPwa put in for all Licensed Firearm owners and the shooting community in general. SFFPwa support all aspects of shooting from Hunting to Target and Clay Pigeons plus anything in between that is legal.